Instead of using annotation such as the previous post. In this tutorial we are building a java servlet 3.0 example using web.xml. The servlet is configured in web.xml. It means that you tell the servlet container or application server about the detail of servlet. 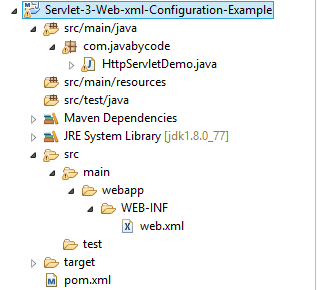 This is second post of series of Java Servlet Tutorial. This series tutorial will provide you full knowledge about Servlet 3.0. We should add depedency for servlet such as below. Servlet Container or Application Server has built in servlet support so we need to set the scope is provided. Deploy war file on application server. After push the file war and run application server we access the address http://localhost:8080/servlet-demo/servlet/Demo-Servlet. The result should be such as the figure below.